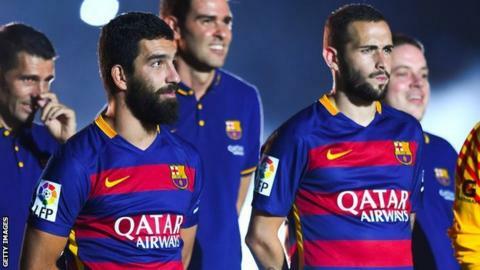 Barcelona summer signings Aleix Vidal and Arda Turan could make their debuts this week after the 14-month ban on the club registering players expired. Defender Vidal signed for £13m from Sevilla and will wear 22 while 28-year-old midfielder Turan, who joined from Atletico Madrid, gets the No.7 shirt. The pair are eligible to face Espanyol in the Copa del Rey on Wednesday. "The boss knows we have been training for months to be in prime condition when he needs us," said Vidal, 26. Turan - who has 87 caps for Turkey - signed for £26m from Atletico, where he won La Liga and reached the Champions League final under Diego Simeone. Right-back Vidal helped Sevilla to Europa League success last season and is expected to eventually replace Dani Alves. Fifa imposed the ban on Barcelona for breaking rules on signing international youth players. An appeal to Fifa was dismissed, as was another appeal to the Court of Arbitration for Sport. Despite being unable to sign players in 2015, Barcelona won La Liga, the Copa del Rey, the Champions League, the World Club Cup and the Super Cup. They sit in second place in La Liga, two points adrift of leaders Atletico with a game in hand, and are in the last 16 of the Champions League, where they face Arsenal.